He moves over and she snuggles in close to her fiancé. She pulls their blanket over them. A special blanket made just for this moment. “I love you” she murmurs, soaking in his face and his warmth. “Goodnight lovebirds,” his mother teases as she turns out the lights. This moment is both tender and tragic: tender because they are demonstrating their love for each other, tragic because this is happening in the ICU. Her fiancé is on life support and he is dying. He moved over because I moved him over to make room for her in his narrow hospital bed. 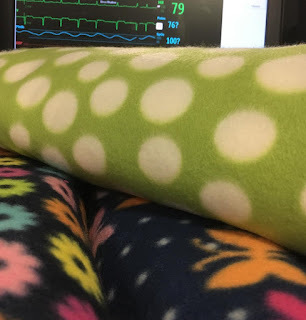 I repositioned his ventilator tubing and central lines out of her way, closed the side rail behind her for support, and helped her pull their blanket over them. This blanket was made by ICU nurses for moments like this: to have something to offer when medicine doesn’t. Using our own time and money, we gather together to make blankets. We make them in many colors and patterns, to match the many styles that come from all walks of life. 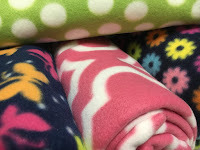 They are simple fleece tie blankets, the kind a Girl Scout might make, but they are soft and warm. They are something soft amidst the harsh reality of critical illness and death, and something to provide warmth and comfort--to touch a loved one during last moments as if to capture their essence before they are gone. The blankets are a memento of touch to take with them when they leave this place and their loved one behind. the “I wish we had better news” has been said. And sometimes we give our blankets when it hasn’t been said yet. We know when it’s time usually before anyone else, before the family realizes or the physicians are ready to admit. We give them at our discretion; we do not need an order. We have blanketed older patients so that husbands or wives of many years will have something that remains. We have covered a young mother dying from cancer with two, one for each of her preschool-aged children, so when they don’t have memories of their mother’s arms around them they will have her blanket and know it came from her. We provide markers so that those coming to say goodbye can write a message of love. When the patient dies we leave it to the family to decide where it goes. Some choose to leave it behind. Some choose to keep it with the patient after death. Many take it home with them. It is our gift of love in a time of sorrow, and how they choose to accept it is honored. Our hope is that these blankets will warm their hearts and cloak their grief. 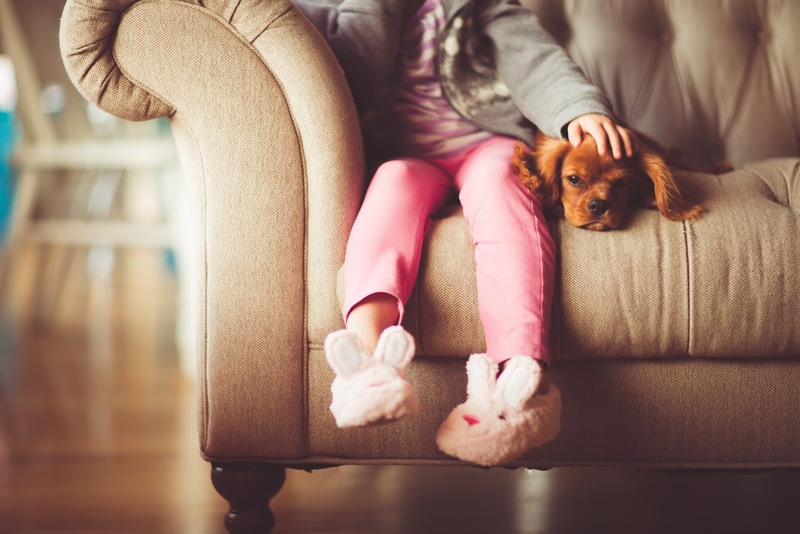 “Blanket” defined as a verb means “to cover completely with a thick layer of something.” Synonyms include “cover,” “shroud,” “swathe,” “envelop,” and “cloak.” By using the term “cloak” my intention is not to cover or obscure grief, to pretend it isn’t there. By using the term “cloak,” I am referring to the Latin origins of the word, “pallium,” now in its current English form as “palliate.” To palliate means to make something less severe, to ease and soothe, without removing the cause. Our intention is to hopefully make grief less severe, to ease it in some small way through a simple gesture of cloaking the dying with a blanket created from caring. On this particular night my patient already had a blanket, one that had been autographed with messages of love, one that had covered him and his mother earlier when she moved in close to say tender goodbyes. But I realized he had two important women in his life who needed comfort. His mother, who loved him before his birth and never left his side, and his devoted fiancée who dreamed of a future with his own children that would never come to be. I took her out to our supply of blankets to choose the one just right for them. She instantly liked a light green one with polka dots. Although she was hoping for purple, his favorite color,our selection didn’t offer a purple one that was masculine enough for the strong man she knew. I told her, “He loves you. He’d be happy if you chose the one you really like.” And so it was the light green one that she snuggled under close to him, sleeping peacefully while his heart took its last beat. It was the green one that she clutched to her chest after he died, her face a blank slate of shock and disbelief. It is the green one that I pray she still holds tight in her time of grief, feeling the same sense of closeness and tenderness she felt on their last night together. 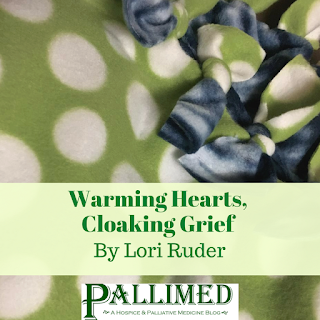 It was a simple fleece blanket, tied together by ICU nurses who bear witness to much suffering, sadness, and loss. It was something to offer that didn’t cause pain and only provided warmth and comfort. These blankets are tied together by our sincere desire to palliate the heartbreak of our patients’ families and, selfishly, our own. Lori Ruder MSN RN is a Certified Hospice and Palliative ICU nurse in the Medical Intensive Care Unit at University Hospitals Cleveland Medical Center. Many times spoken words can’t give her heartfelt and heartbreaking experiences justice, so she writes them to remain resilient. If you’d like to summon your inner Girl Scout and help the cause you can find her on Twitter @LoriRuder.